Editor's note: The SABR Salute, first bestowed upon writer Fred Lieb in 1976, was designed as a manner of recognizing the contributions of some of the older members of the Society. Subsequent SABR Salutes appeared in the SABR Membership Directory and honored members who had made great contributions to baseball historical research. 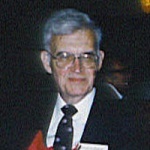 Ray Nemec, one of SABR's 16 founding members, received the SABR Salute in 1988; the following biographical sketch appeared in that year's membership directory. When Ray Nemec was born in a Chicago hospital on June 19, 1929, the doctor who delivered him told his mother that "she had given birth to a future ball player." The medico apparently was a fan of Lou Gehrig, born on June 19, who, that very day celebrated his 26th birthday by hitting a homer against the Red Sox. Ray did grow up to be a six-footer who batted and threw left but he never hit a ball out of Wrigley Field. Ray dates his baseball research interests from 1939 when he bought his first Reach Guide. The next year when the Cubs sent a sore-armed Dizzy Dean down to Tulsa for "rehabilitation" he bought his first Sporting News to see how "Ole Diz" was doing in the minors. By 1941 he was compiling stats for his favorite teams in the lower classifications. This continued through his high school days and by 1950 he was establishing contact with other minor league researchers. One was Willie George, a future SABR member from West Virginia. Later he met Paul Frisz, Karl Wingler and Lee Allen. They shared Ray's frustration with leagues with no official stats like the 1932 Eastern, the 1934 Central, and many others, and encouraged him to put together those records. He first worked on the 1915 Bi State League (Illinois-Wisconsin) and then the 1885 Western League. Lee Allen was then working on the 1871-75 National Association and Ray provided data from Rockford and Chicago. Then it was the 1879 Northwestern League and the 1877 International Association, the first minor league. The 1910 Northern Association was of special interest to Ray because Casey Stengel had played at Kankakee and several of the cities were in the general area. Ray used to travel to most of the sites. In 1969 he was quoted in the Chicago Tribune as saying "I've been in almost every library of every town that's had a minor league team in Iowa, Illinois, Indiana, Michigan, and Wisconsin .... I covered more than 2,000 miles compiling statistics of the 1884 Northwestern League." Later, when newspaper microfilm became more generally available, he cut down on travel and bought his own microfilm reader. His work on 19th century leagues certainly helped establish the extent of black player participation in the minor leagues of that era. His work on player records of the 1920s and 1930s resulted in many requests from old ballplayers (primarily referrals from Lee Allen) who wanted their career stats. This turned out to be a beneficial exchange because these players could supply and verify first names of other minor leaguers. In the late 1950s and nearly 1960s Ray supplied corrections in annual league averages to the Howe News Bureau and to The Sporting News. He also worked out an arrangement with TSN publisher G. Taylor Spink to supply minor league records for Daguerreotypes of Great Stars of Baseball. A correction to a 1963 TSN article by L. Robert Davids established the contact which resulted in the planning for the first volume of Minor League Baseball Stars. Much of Ray's material also was included in the second volume and will be included in the third as well. In 1958 Ray established the rather grandiose objective to compile the lifetime records of all major/minor league players. Obviously he has not attained that goal but last year he used a rulebook to measure the ample footage of career files that line his basement rooms and estimated that he had about 100,000 player records on hand. No wonder that Lee Allen, before he died in 1969, called him "the foremost authority on minor league players." In spite of the time he has devoted to baseball research, Ray has led a fairly balanced life. He has had a full-time job since high school with Corn Products Company International at Argo, Illinois, where he does the production planning and scheduling for such products as Mazola Corn Oil and Karo syrup. He also has taken courses at the local junior college, managed a little league baseball team, has written columns for local newspapers, and several as a radio announcer. He and his wife Loretta have been married for 34 years and have four grown children. He also has had several hobbies over the years not related to sports. That's hard to believe, considering how much time he has put into baseball research. Related link: Read more about Ray Nemec and the other founding members of SABR, "The Cooperstown 16"
To get back to the SABR Salute page, click here.